IOM. Dietary Reference Intakes for Vitamin A, Vitamin K, Arsenic, Boron, Chromium, Copper, Iodine, Iron, Manganese, Molybdenum, Nickel, Silicon, Vanadium, and Zinc : a Report of the Panel on Micronutrients external link disclaimer. Washington, DC: National Academy Press; 2001. Coplin, M., et al. (1991). Clinical Therapeutics, 13(5): 606-12. Shankar AH, Prasad AS. Am J Clin Nutr 1998; 68:447S-63S. 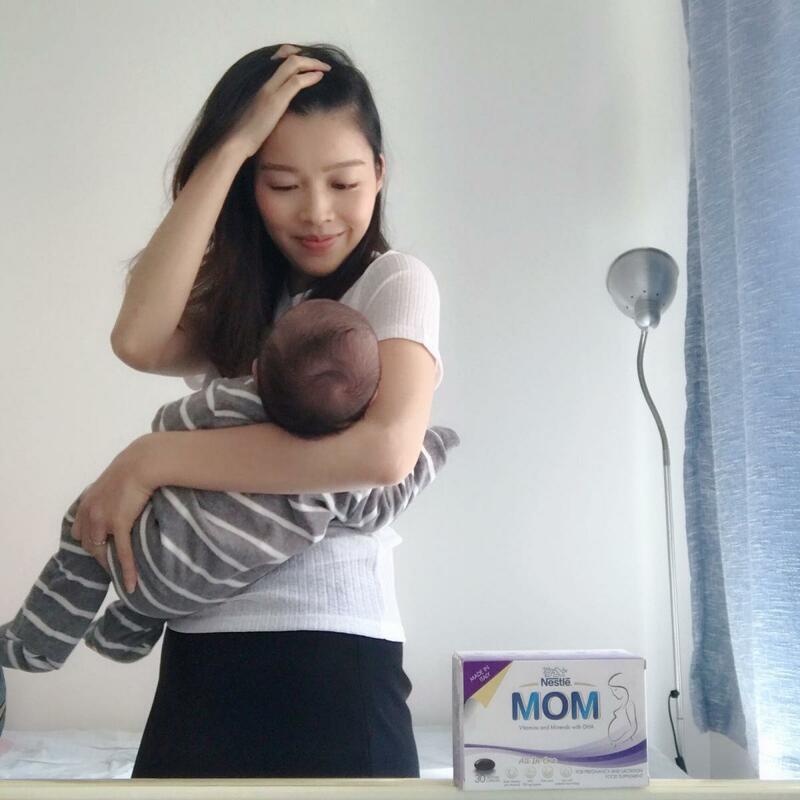 + 以上換算食物代表每粒雀巢®NESTLÉ® MOM鎖養膠囊所含有指定營養素的相對食物分量，雀巢®NESTLÉ® MOM鎖養膠囊的一些額外維他命和礦物質成分並未列於附表中。相對食物的其他營養素不包括在內。1杯=250毫升。附圖只用作說明，上述食物所含的營養素生物利用度並未與雀巢®NESTLÉ® MOM鎖養膠囊作直接比較。USDA National Nutrient Database for Standard Reference, Release 28. 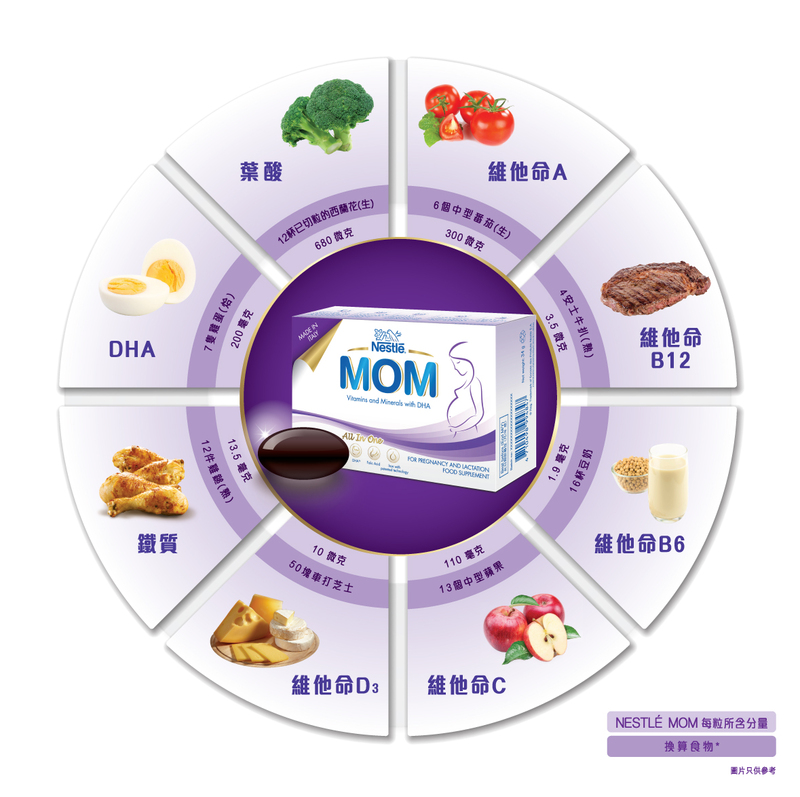 "由 (懷孕時) 認識 #雀巢 ®NESTLÉMOM®鎖養膠囊開始，就一直每日1粒 。直到而家 (生咗)都 keep 住食 ，keep住鎖養 ，keep住自己有足夠營養，幫到我免疫力，病少啲令Marat仔飲嘅母乳量都keep住上升，你睇我哋幾醒神！"
"好多孕婦會容易疲勞，特別懷孕初期身體會經歷好大變化。我頭三個月時候工作排到密密麻麻，出席公開活動，擔任主持工作，回到家繼續睇稿等等，十分忙碌。當時未能同大家分享喜悅，但需要keep 住最佳狀態視人。幸好我懷孕前已經認識 #雀巢®NESTLÉMOM®鎖養膠囊。每日1粒就提供到鐵質、足量 (200毫克) DHA同葉酸等關鍵營養，工作再忙都吸收到營養比我同 #BossBaby，令我充滿精神及活力去迎接每一天！"